Are Foreign Devil Translators Hijacking China’s Debut on the Global Literary Stage? Ever since China was named Guest of Honor at the 2009 Frankfurt Int’l Book Fair, overseas publishers have begun to take an interest in contemporary Chinese literature, and the list of works of fiction and poetry slated for translation and publication into English in 2011 and 2012 is growing quickly. Take a look here for a partial list. They include Zhang Ling’s Gold Mountain Blues (translator: Nicky Harman), Endure: Poems by Bei Dao (Lucas Klein and Clayton Eshleman), Yan Lianke’s Dream of Ding Village (Cindy Carter), Wang Xiaofang’s Notes of a Civil Servant (Eric Abrahamsen), He Jiahong’s Blood Crimes (Duncan Hewitt), and more. 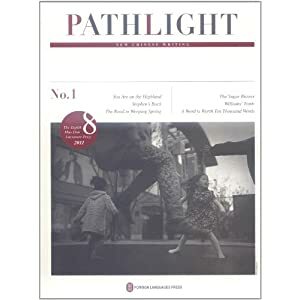 In December the venerable People’s Literature (人民文学) magazine launched an all English quarterly (at left) featuring translations of works by several popular 21st-century Chinese writers, Pathlight: New Chinese Writing. Of course, Han isn’t the only one concerned about the fact that the officially funded campaign to “export” Chinese literature—seen as an extension of China’s soft power—seems to be largely dependent on foreign brains for the moment. But the catch with Han’s patriotic vision is that Made-in-China, Chinese-to-English literary translators are regrettably thin on the ground. The author of the China Youth Newspaper article, Meng Xiaoguang (孟晓光), cites some interesting factoids: as of 2007, only 15 universities in China had M.A. programs in translation, and they have produced under 400 graduates. Underlying the opinions expressed by Han Haoyue, Huang Youyi and Meng Xiaoguang is a concern that somehow China is not sufficiently in control of its literary exports, and something needs to be done about this. It’s about money, stupid: Talented Chinese aren’t in the Chinese-to-English literary translation market primarily because the pay is miserable. If you’re paid by a Chinese publisher, you generally get a terribly low one-time fee and none of the royalties. If you’re paid by a foreign publisher, you’re lucky if you average US$1,000 monthly. Outside of China’s inward-looking environment, it is widely recognized that when rendering a literary work—unlike technical or commercial translation—the translator ideally translates into his or her mother tongue. That’s because literary translation is not really about accuracy; it’s about things like maintaining register, setting rhythm and employing an appropriate tone, all of which are more easily mastered by a native speaker. The idea that just because a non-Chinese surname appears in the “Translated by” section of the title page doesn’t mean that native Chinese speakers didn’t play an active part in proofreading or translating a given novel. And there are plenty of pairs of English and Chinese speakers who work together to translate fiction. They include Howard Goldblatt and Sylvia Li-chun Lin, and Jane Weizhen Pan and Martin Merz. Actually, I’d say that given the profundity of Chinese literary expression, it stands to reason that it would be more appropriate for native writers of English to complete the task of translation, since you wouldn’t want the profundity of that expression to be expressed by anyone but the most deft handlers of the language. It is pointless to say that Chinese culture is too profound and Chinese feelings are too subtle for “foreign devil translators” to understand and that Chinese translators “logically speaking” 照理 are more appropriate to complete the task of translation. English literary expression is difficult to master, too. How can one be so sure that Chinese translators can capture the voice and set the right rhythm in the English language? Such a 理 cannot be 照ed. If a Chinese translator does not know much about the great famine of the 1960s, or the Cultural Revolution, or much about this and that, and has no interest let alone courage to carry out the research due to “various reasons” 种种原因 how can he/she do a good job in translating Bi Feiyu’s Three Sisters, or Yan Lianke’s Si Shu? In this case, Chinese culture is also too profound and the Chinese feelings too subtle for this Chinese translator 中国翻译家. The same logic goes to foreign devil translators as well. Being able to speak fluent Chinese in a bar doesn’t guarantee the foreign devil translator can produce a translation which captures the voice and sets the right rhythm. It is pointless to judge or predict the quality of a translation based on the translator’s nationality or language background. It takes more than “the right” nationality and language background to produce a good translation. We all have the experience of reading good and bad translations produced by native speakers, be it in English or in Chinese. Why don’t people, including Mr. Han, judge the quality of a translation on its own merits? A person who grew up in southern China may not fully understand the subtlety of a literary work set in northern China. Some translators are very good at translating classical Chinese but have little interest in translating modern literature, while others are hopeless in reading classical Chinese let alone translating it, but are very good at translating modern Chinese literature. There are many hurdles and possibilities. Why can’t people judge a translator based on his/her performance on a case by case basis? Rather than worrying about Chinese culture being too profound for foreign devil translators to fully understand without improving the situation under which it is difficult for freelance foreign devil translators (even local devils) to gain access to library resources and to learn about Chinese culture, why don’t organizations like the Writers’ Association 作协, for example, coordinate programs that provide foreign devil translators as well as local devil translators greater access to library resources, professional development funding and opportunities so that Chinese culture can become “less foreign” to everyone? The mentality of “those foreigner devils vs. us Chinese” is counter-productive and dangerous. Deng Xiaoping once famously said, “It doesn’t matter whether the cat is black or white, as long as it catches mice.” Does it really matter if the translator is a foreign devil as long as he/she is a good translator?” After all, everyone’s dream is for people in other cultures to have greater access to Chinese literature. Does it really matter if it is also the dream of foreign devil translators? Why can’t people from all language backgrounds work together to make this dream come true? What happened to “one world, one dream” of not so long ago? I couldn’t agree more with the above comments. That “foreignness” precludes understanding seems to also be the political mainspring at the moment. “We shall interpret our own actions regardless of outside interference” — which of course makes a mockery of any future cross-cultural dialogue. I am merely a reader, not a translator, but I often discuss the challenges, both linguistic and political, with my better-rounded Chinese students. They, whose brainwash (now fortunately re-washed) has included many of the reasons-against already mentioned, usually offer that their education doesn’t (or cannot) teach literary criticism skills — surely the first step on the road to loving literature and then wanting very much to translate it.